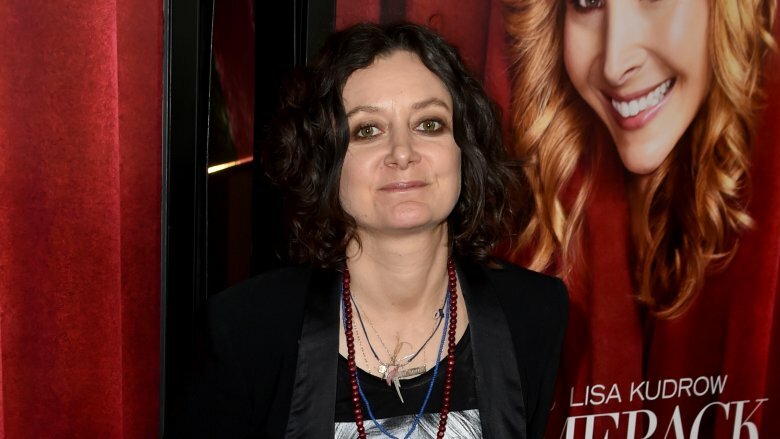 Sara Gilbert has been lighting up our television screens for more than three decades. After some early, requisite appearances in commercials and made-for-TV movies, Gilbert rightfully became a star with her complex and charismatic performance as sarcastic, misunderstood, middle-child Darlene Conner on ABC's Roseanne from 1988 to 1997. While Gilbert has scored some movie roles over the years — particularly in cult classics such as Poison Ivy and High Fidelity — Gilbert will always be associated with television because that's where she became a household name. In addition to Roseanne, Gilbert has given us memorable turns on The Big Bang Theory (as Dr. Leslie Winkle), The Simpsons (voicing Laura Powers, Bart's babysitter and first crush), and The Talk, the CBS talk show she's co-hosted since 2010. Following the Roseanne reboot and its spin-off, The Conners, Gilbert is back in the limelight again. Let's take a closer look at the untold truth of her colorful life and what's come out about her since the return of Darlene. For most people, "joining the family business" means taking over the farm or the hardware store. 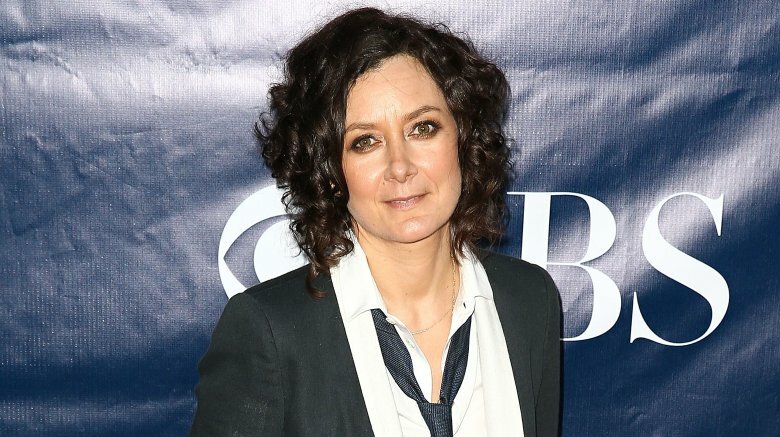 For Sara Gilbert, it was the television industry. It's not to say that Gilbert didn't pay her dues or work hard, but her family has deep roots in the small-screen biz that go back decades, basically to the beginning of the medium itself. Gilbert's grandfather was Harry Crane, a TV writer who got his big break working for Jackie Gleason's variety show Cavalcade of Stars (via The New York Times). In 1951, Gleason asked Crane and co-worker Joe Bigelow to come up with a sketch about a working-class Brooklyn guy and his long-suffering wife. Crane and Bigelow created the characters of Ralph and Alice Kramden, aka "The Honeymooners," which became the most popular segment of Cavalcade of Stars and then its own standalone series, one of the biggest hits in TV history. Crane, who died in 1999, was also the grandfather of another big TV star: Melissa Gilbert, who for nine years portrayed Laura Ingalls on Little House on the Prairie. Ah, Half-Pint and Darlene are sisters! Before we get into more of the cool stuff Sara Gilbert has done, let's talk about something that Sara Gilbert didn't do — The Facts of Life. NBC's long-running hit series (1979–1988) saw main characters Tootie, Blair, Natalie, and Jo age from teenagers to young women graduating college and running businesses. In 1988, producers weren't quite ready to let their show go, so they used the finale as a "backdoor pilot" — a try-out for a potential spin-off. The plot: Blair (Lisa Whelchel) agrees to take over the school's old setting, the Eastland Academy boarding school, essentially rebooting the show back to its beginnings. Except this time, it was co-ed, and among the new students were characters played by future stars Juliette Lewis, Seth Green, and Mayim Bialik. Gilbert almost made it into that cast — she auditioned for producers a whopping five times (via People). She didn't get the part, but that proved to be a good thing. NBC didn't pick up the all-new Facts of Life, but had it gone into production, it would have hit the air in the fall of 1988, the same time as Roseanne, meaning Gilbert would have missed out on her career-making gig. The thing about writing is that it's hard, or at least it's hard to do well. 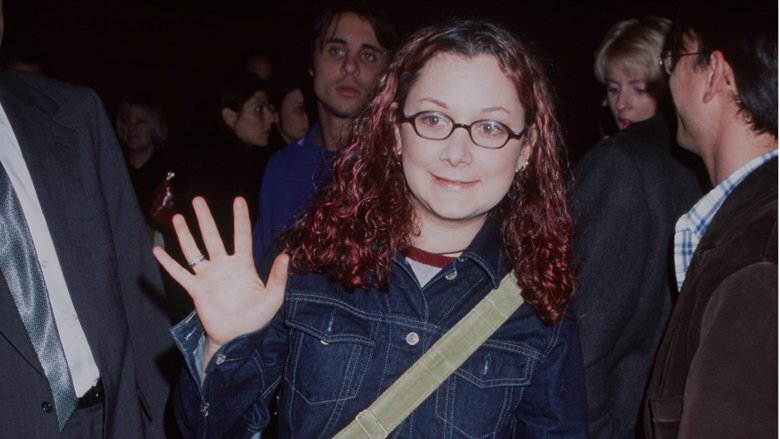 It's particularly difficult to write for television, let alone for an established and popular series, and yet Sara Gilbert was up to the task when she was just 17. Gilbert couldn't legally vote or buy fireworks when she penned the original story for a Season 4 Roseanne episode called "Don't Make Me Over." (The actual shooting script based on Gilbert's story was written by staffers Maxine Lapiduss, Don Foster, and Sid Youngers.) It's a good episode: Darlene and Becky want to treat their mom to a Mother's Day spa package, but Roseanne finds out that the real reason they arranged it was to attend a rock concert hundreds of miles away. Clearly, age was nothing but a number for Gilbert, at least as far as her work on Roseanne was concerned. In 1993, 18-year-old Gilbert earned an Emmy nomination for outstanding supporting actress in a comedy for her portrayal of Darlene, making her one of the youngest acting Emmy nominees ever. Gilbert realized that she was attracted to women when she was in her late teens, when she was dating — and getting physically affectionate with — her on-screen Roseanne love interest, Johnny Galecki. But just before she figured out her sexuality, Gilbert recalled on The Talk that she thought Galecki was "super cute" and that she "had a crush" on him (via Today). "We started dating, and he would come over and we would, like, make out, and then I would start to get depressed," she said. Gilbert said Galecki noticed that making out with him made her sad, and that's when she thought it was time to tell the truth. "I eventually told him I thought it was about my sexuality," she said, "and he was super sweet about it." 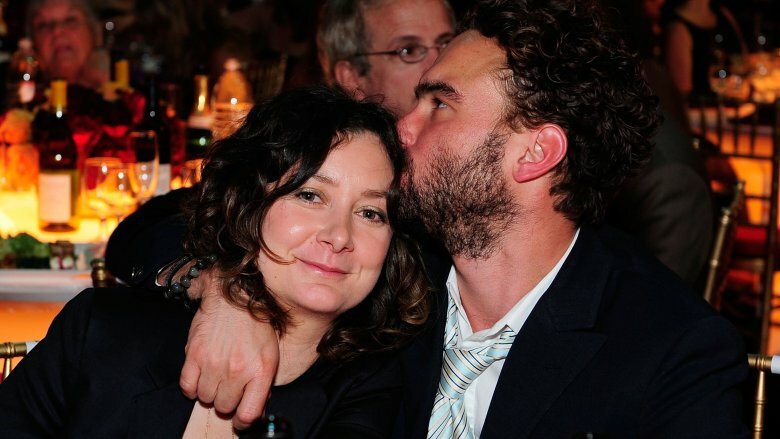 These two have remained friends, and when Gilbert decided to publicly come out in 2010, she asked Galecki for permission to tell her story and share his role in it. Galecki was beyond supportive. On The Talk, Gilbert said that he told her, "I'm so proud of you. If you want, I will be there, and I will hold your hand." Hey, what's going on (with Sara Gilbert's love life)? 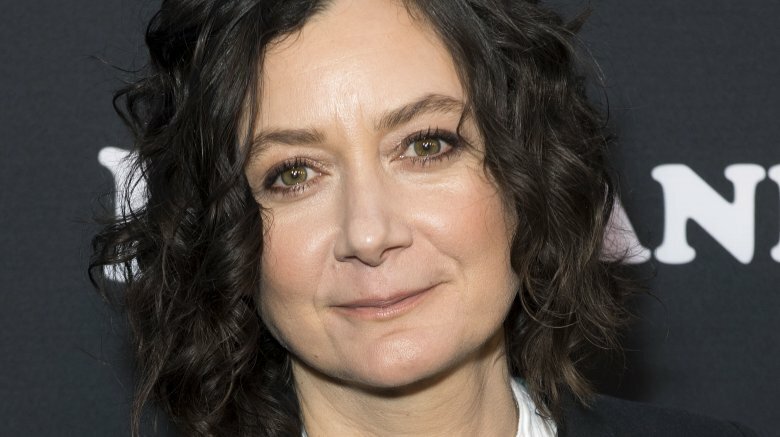 Sara Gilbert has a type, and that type is remarkable and powerful women in the arts. While not publicly out as a gay woman, Gilbert and TV producer Allison Adler were partners for about a decade. If you don't know the name "Allison Adler," you're probably still familiar with her work — she's produced and written episodes for Family Guy, Just Shoot Me, Chuck, and Glee, among other things, and she created the Supergirl TV series. The couple had two kids together: a son named Hank born in 2004 and a daughter named Sawyer born in 2007. The couple announced its split in 2011, with Gilbert's rep telling People it was "completely amicable." 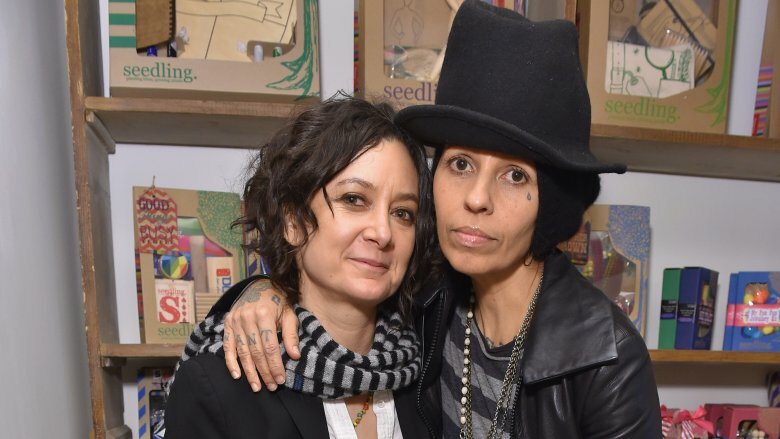 A few months after the breakup, photographers caught Gilbert holding hands in Hollywood with Linda Perry. She's a super-producer who's helped craft the careers of Pink and Christina Aguilera, but who first found fame in 1993 as the lead singer of 4 Non Blondes, the band behind the indelible one-hit wonder "What's Up." Gilbert and Perry got hitched in 2014. 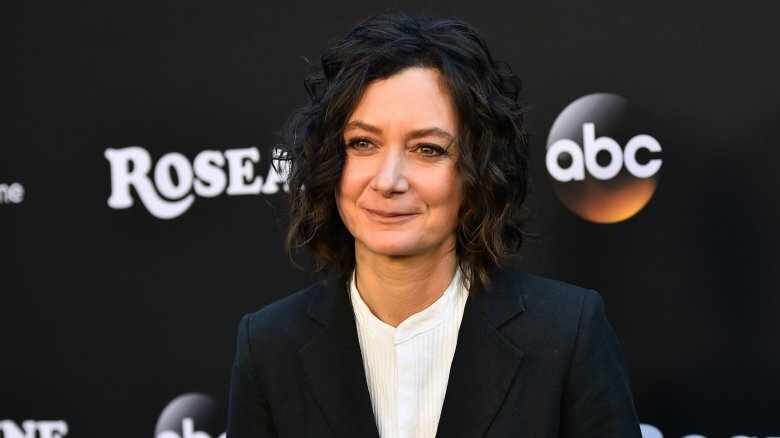 Sara Gilbert has endured more than her fair share of short-lived TV series, but at least those made it to the air and had a shot at finding an audience. Gilbert has also been in the cast of some promising pilots that were summarily rejected by the networks before they even got off the ground. In 2004, Gilbert was one of many former teen stars cast in In the Game. Created by and starring Jennifer Love Hewitt as a sports TV producer thrust into the role of an on-air ESPN reporter, it also featured Josie Davis from Charles in Charge, Alyson Hannigan from My Stepmother is an Alien. The show was beset with difficulties. ABC planned to use In the Game as a mid-season replacement, but then canceled the whole thing without ever airing it. Some time later, Gilbert joined an ABC pilot called Girls on the Bus, portraying a news reporter named Helen covering a political campaign. It didn't make the fall 2006 schedule for the Alphabet Network. Gilbert had another TV comeback that didn't work out, but it wasn't because the show was canceled. 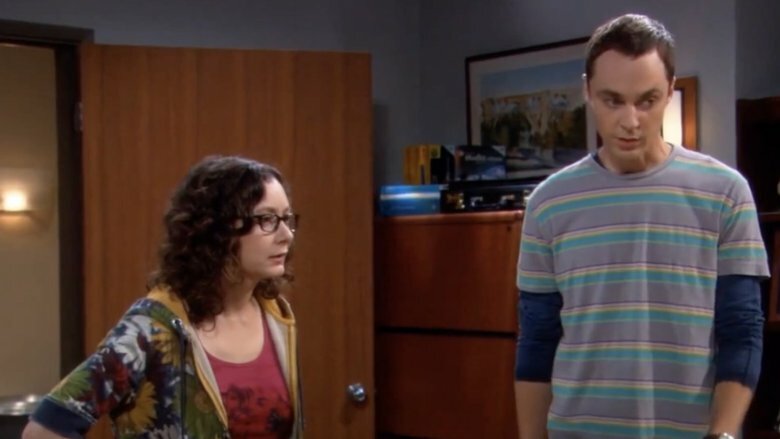 During the first couple seasons of The Big Bang Theory, Gilbert portrays Dr. Leslie Winkle, a brilliant experimental physicist, nemesis of Sheldon Cooper (Jim Parsons), and love interest for Dr. Leonard Hofstadter, marking a reunion with her Roseanne castmate Johnny Galecki. But in January 2009, just five months after her upgrade to series regular, Entertainment Weekly writer Michael Ausiello noticed that Gilbert had "practically vanished" from the show. Ausiello consulted his inside sources and learned that Gilbert had been knocked back down to "recurring" because the show's producers couldn't think of anything more to do with Winkle. By the end of the second season, Winkle had started and ended a relationship with Howard (Simon Helberg) and then disappeared until a cameo appearance at the end of Season 3. Gilbert did return to the imaginary world of fast food-loving nerds for another special appearance six years later. Harsh truth: Actors aren't always like the people they play on screen. For example, the kid who plays young Sheldon on Young Sheldon isn't a preternaturally gifted science genius, nor is Bob Odenkirk actually a slimy New Mexico-based attorney. They just pretend that they are. 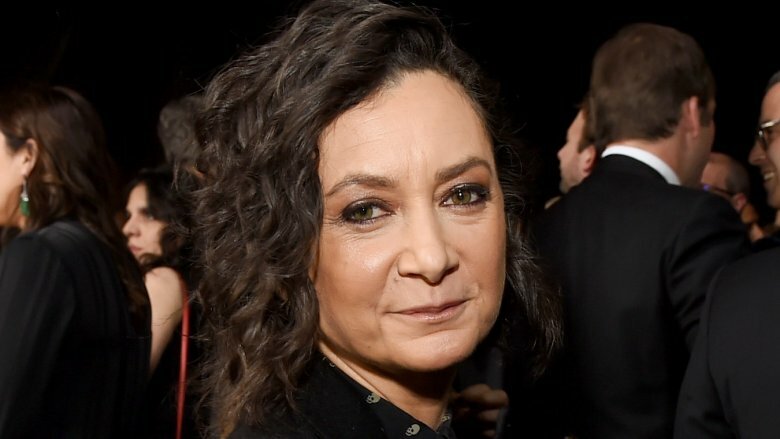 But then there's Sara Gilbert, best known for playing the sharp-witted and sharp-tongued Darlene Conner on Roseanne. It turns out she's just as smart — probably more so — in real life. While working as a child actress in the 1980s, Gilbert attended a Los Angeles-area private school and got straight A's. Those marks certainly helped when it came time to apply to college. Gilbert attended an obscure, fairly well-regarded, northeastern institution called Yale University. Maybe you've heard of it. A testament to her smarts and mental capacity, Gilbert didn't leave Roseanne while she attended school (where she studied art and photography). Instead, producers arranged for her to shoot her scenes on a soundstage that was specially constructed for her in New York. 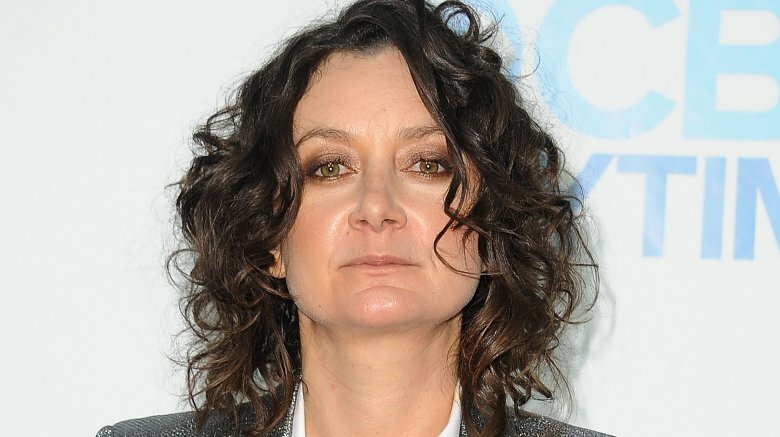 As Sara Gilbert related on The Howard Stern Show in 2011, the actress was soaking in the bathtub about a decade earlier when she got a great idea for a TV series. Gilbert thought TV needed a daytime talk show that discussed current events and pop culture happenings, but from the perspective of a mother. Gilbert pitched her idea to CBS, which needed a show to replace its long-running soap opera As the World Turns. The result was The Talk. Is it a lot like The View? In that it's a daytime talk show that discusses current events and pop cultural happenings (and interviews celebrity guests) that's hosted by a panel of women? Sure, but The Talk tries to come at viewers from a parent's perspective. Gilbert is a host and executive producer on the show, which, at various times, has also starred Julie Chen, Eve, Sharon Osbourne, Sheryl Underwood, Leah Remini, Marissa Jaret Winokur, Holly Robinson Peete, and Aisha Tyler. 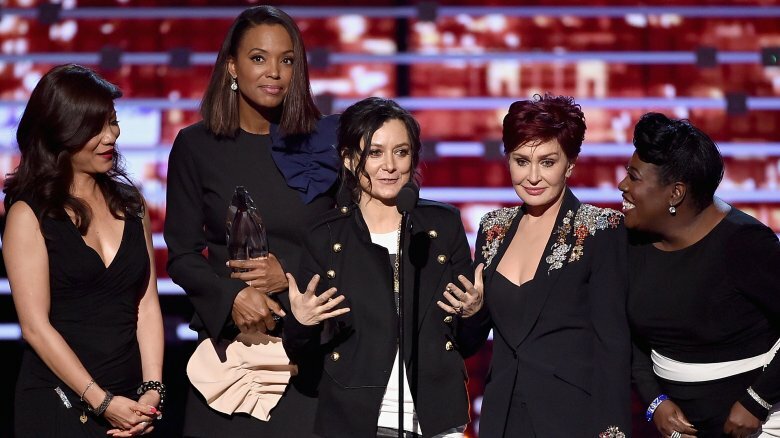 Since its debut in 2010, The Talk has taken home the Daytime Emmy for outstanding talk show/entertainment three times to date. While Sara Gilbert may have conjured up the notion of a panel talk show for moms while soaking in the tub one day, that epiphany may have had a bit more inspiration, at least according to a lawsuit. 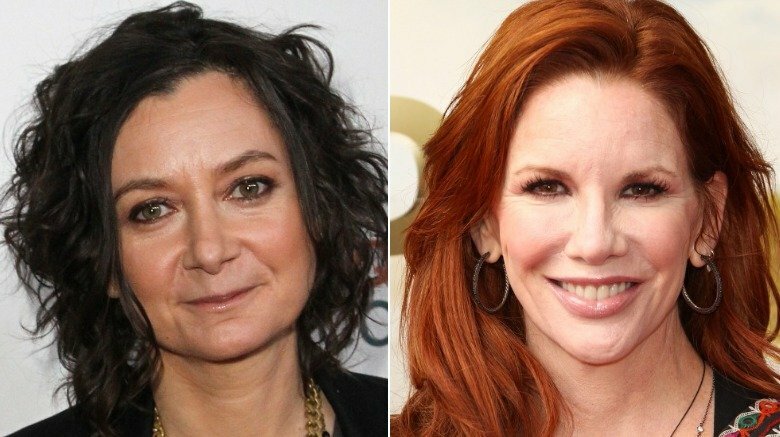 In October 2012, Angela Wilder, author of self-help books such as The Powerful Mate Syndrome, served CBS, production companies RelativityREAL, CBS Television Studios, and various executives, claiming The Talk wasn't the idea of veteran television insider Sara Gilbert. Wilder said it was hers. Now, Wilder may have had a case if she'd pitched her idea for a mother-centric talk show to CBS or to its affiliated companies, but she didn't. Wilder did discuss a show called The Mothers' Hood in a 2009 meeting with Holly Jacobs, a reality programming executive at Sony. Jacobs passed, but Wilder left her treatment with Jacobs. Soon thereafter, Wilder alleged that her ideas were passed along to RelativityReal, a Talk production company, because "Jacobs and Sony had a close working relationship with RelativityREAL." Wilder asked for a full jury trial and sought a huge financial payout, but she didn't get one, and less than a year later, Wilder dropped the suit. The Roseanne reboot marked the first time many members of the original cast had been seen by large audiences in a while, particularly Lecy Goranson (Becky Conner) and Michael Fishman (D.J. Conner), but in addition to her co-hosting gig on The Talk, Sara Gilbert actually had tried her hand at primetime prior to Roseanne's. It's just that many of those projects were short-lived shows. In 2005, Gilbert starred on the WB's Twins as a nerdy woman who runs the family business with her twin (who looks and acts nothing like her.) The series didn't survive low ratings or the WB-UPN merger that formed The CW. Gilbert moved on to a six-episode stint on CBS's short-lived 2007 friends sitcom The Class and participated in a long arc in 2010 on the TNT medical drama Hawthorne. 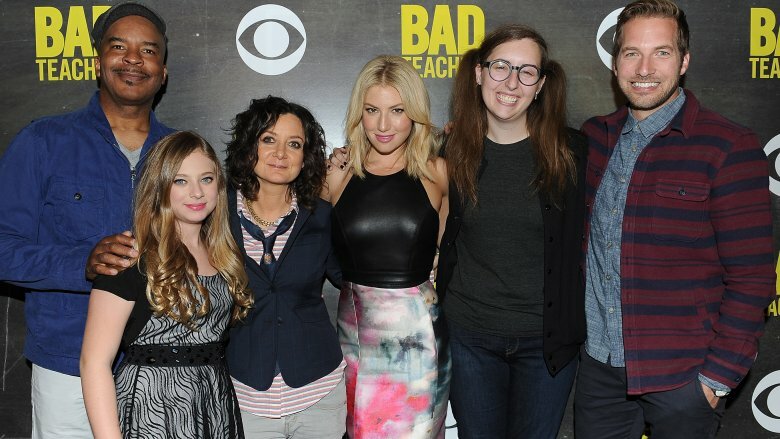 She returned to CBS to play a nerdy educator on Bad Teacher, a TV adaptation of the hit Cameron Diaz movie, but CBS swiftly canceled the show and quietly aired all 13 episodes during the summer of 2014. The Talk, Sara Gilbert's biggest project since Roseanne ended in 1997, is also the reason Roseanne came back in 2018. That's partly because Gilbert wasn't shy about inviting her former Roseanne co-stars onto The Talk. In 2014, Michael Fishman, Lecy Goranson, and Roseanne Barr all showed up to celebrate Barr's 62nd birthday. Then in March 2017, John Goodman was a guest, and the show went all out, re-creating Roseanne's living room set for a scene in which Gilbert, in character as Darlene, shares a secret with Goodman, who played her TV dad, Dan Conner. "I don't know how to say this. I'm a talk show host," Darlene confessed. After the audience laughter died down, Goodman replied, "For a minute there, I thought you were gonna tell me you were gay." That segment was so well-received that it got Gilbert thinking about a full-on Roseanne revival. According to Entertainment Weekly, Gilbert "spearheaded" the Roseanne reboot, serving as an executive producer. "It felt like the right time to put this working class family on TV," she said. "That's a voice that's not been spoken for enough in this country and we feel hopefully that we can be a uniting force in that way."